a little about Max’s favorite things…. Today has been creeping up on me. I've tried to ignore it, but this morning I had a hard time sleeping but I just didn't want to get out of bed. I took my coffee in a mug that was given to Max on his birthday by two of his friends on his 6th birthday. This day - Max's Birthday - has become so significant to me. This is a day that should BE the material birthday of a boy who should be 10, who should be going into 5th grade, who should be here with our family. What it has become, is a remembrance of the things he loved to do, and probably would love to do on this day. I can say that all four of us had a great day today. And we did remember our son and brother with every step we took. We picked up bagels and walked to the beach for the morning. While at lunch, at the Fish Market, of course, Hannah asked if Max would’ve been a rollercoaster kid like her. I said definitely, because he did everything she did. I think she was wondering if Max would have gone on all the crazy rides with her at the fair. Yes, he would have. And he would have gone on all the little kids rides with Nicky to keep him company. Hannah filled in for him at the Fair this afternoon. On our way home Nicky reminded us to pick up balloons for Max. We made a paper airplane with birthday greetings from each of us, attached it to the balloons and sent them all off to him in heaven. We closed the day with one of Max’s favorite TV shows: Dogfights – P51 Mustang. There is much happiness in our lives. How could that be? Well, I think we’re better equipped to take the good as “amazing” on each given day, and live it to the Max. And still there is an underlying sadness that can’t be ignored fully, nor do I wish to ignore it. With every happy memory of Max there is a tinge of sadness no matter how I pretend to play it off. It may not occur to me right away, but it will catch up later. I’ve got nothing profound to say today. This day has exhausted me both mentally and physically. I wish my kid were here. Yeah… I wish Max were here to have a ridiculous party with too many kids, like we used to. 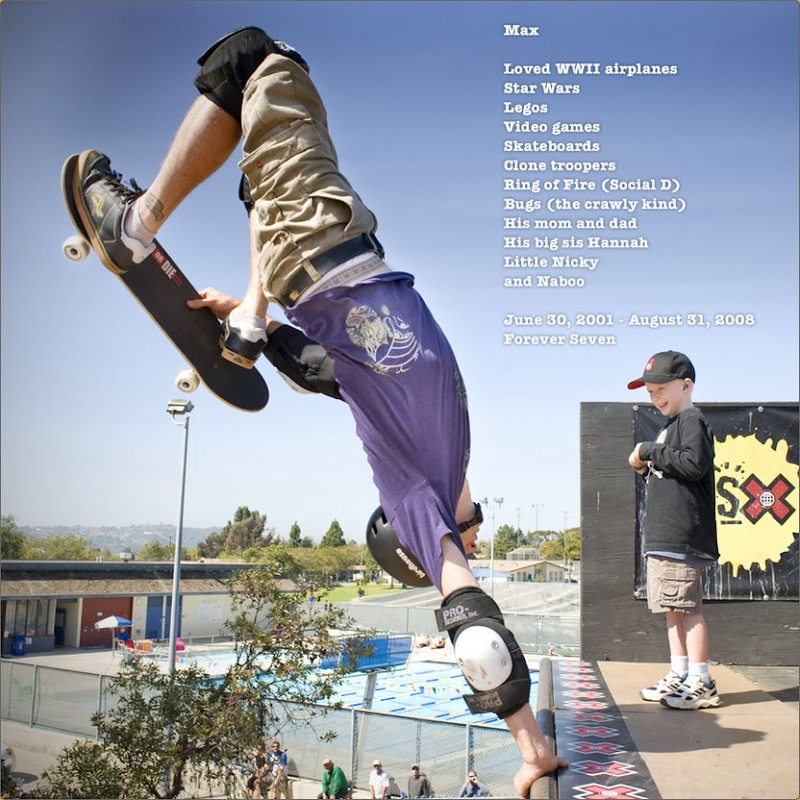 Happy Birthday in heaven, Max. Sorry if this is posted 3x. I don't see it under comments so I'm resubmitting it. We remembered your birthday with Legos. Aiden is starting to show some interest in building things but he is mainly drawn to the vehicles that I built with Lucas and the figurines. Kira is anxiously awaiting the grand opening of the Lego Store. Of course when we heard one was opening in SD, we thought of you. Thinking of you and your beautiful family on your 10th birthday. I wish your kid were here too. I often visit the site because I remember him. He was a special boy. A wonderful post. I admire your writing style. Keep posting.